The electrical system in your home is easily the most dangerous and complex one in your home. You run the risk of deadly shock during a repair and may damage expensive appliances or cause a fire in your walls if you don’t know what you’re doing. There’s also the legal hazard of DIY electrical work. Your homeowner’s insurance may require you to have a licensed electrician and a permit to repair or change your home’s electrical system. Doing small projects like replacing a bathroom faucet or a shower head is okay for do-it-yourselfers. But anything bigger, like installing a new toilet or ripping out a sink, requires know-how you’re not going to find in a YouTube video. In general, trust a professional for anything that means digging into your walls. Doing work yourself may also cause your legal trouble. As with electrical work, your insurance may require a licensed professional to complete it. Any work in your home that requires removing walls or constructing an addition requires not only a professional contractor but also an engineer or architect to ensure the work you want to do won’t put your house at risk. Some walls are load-bearing, which means they play a huge part in holding your house up. Removing them may cause a sagging ceiling or even collapse. You may also damage your pipes and gas and electrical lines. Just remember that it may cost you a lot more to make repairs than it will to hire a professional to do the work in the first place. Installing windows may not seem dangerous. But it does require special tools and knowledge to ensure you remove and replace your windows without exposing yourself to lead or jeopardizing the structure of your home. Plus, your work won’t have a warranty like you would get from a professional installer. That might be a problem if you ever decide to sell your home. Cutting down a tree can be dangerous work and may cause you legal problems if you send a tree trunk crashing into your neighbor’s living room. It’s also very expensive to get the equipment you need to do the job properly and safely. Trust me, it’s easier to rely on a professional to get your trees down safely and remove the stump. There are going to be rehab projects in your home you may feel comfortable tackling with the help of a YouTube video or a DIY book. But for anything you’re uncertain about doing, hire a professional. It’s important to trust the expertise of those who have the training and experience to do the job correctly the first time. Redhead Properties can connect you with professionals to help you with your home improvements. Call Cindy Marlowe at 303-912-1478 for a recommendation today. While they’re working on their home improvements, you can work on you. Start by downloading “7 Ways to Invest in Yourself” for a number of personal development activities to improve your quality of life. 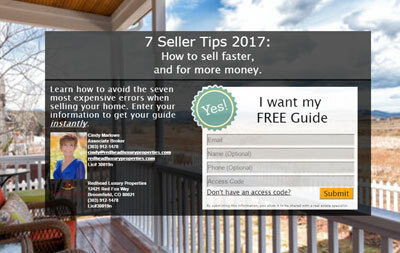 Discover how to sell faster and for more money with these 7 tips. Disclaimer: Blogs and articles by Cindy Marlowe and Redhead Luxury Properties are for informational purposes only and to give you a general understanding of the Colorado real estate market. The information presented may not reflect the most current state of the Colorado real estate market. These materials may be changed, improved, or updated without notice. Redhead Luxury Properties and it’s associates are not responsible for errors or omissions in the content of this site or for damages arising from the use or performance of this site under any circumstances. Whether it’s your first luxury home, your next home, or an investment property, let Cindy Marlowe and her team help you buy or sell with a level of simplicity you never thought possible. Discover why she’s become so many buyers, sellers and investors “go-to” luxury real estate agent. Subscribe today to receive monthly updates, seller perks, and the latest news on the Colorado Real Estate Market. We respect your mailbox and will never share your information.